choked with exhaust fumes, and stifled by traffic – it’s unlike other cities in so many others. Poverty is not confined to neighborhoods on the outskirts. Faith is boldly proclaimed in the names of stores (“God is Good Beauty Salon”) and on taxis (“His Grace Taxi Service). Street hustlers, hawkers, walk up and down in traffic selling everything from bags of water to windshield wipers to meat pies for what amounts to a few cents. Tall buildings are few – this is not a city of sky scrapers – and they are often tattered and worn down. Life is hard here, and it is evident straight away. But something else is also immediately evident: warmth, and not just the warmth (blistering heat and nearly unbearable humidity) that is sub-Saharan Africa. The people are friendly, welcoming, and ready with smiles. In a country where the average income is about $400 annually, you might expect fewer welcoming smiles and more resentment toward first-world visitors. You might think that their poverty would make them forlorn and withdrawn. But you’d be wrong. That’s not to minimize their hardship nor to say that they do not experience struggle, it’s just that they, as a people, don’t put it on display. In fact, they are a grateful, happy, deeply faithful, and proud people. It is a striking difference from Americans who loudly lament any minor thing that goes wrong and proclaim through bull horns how uncomfortable they are. I would come to appreciate the Ghanaian way of being in the world more fully in the days to come. 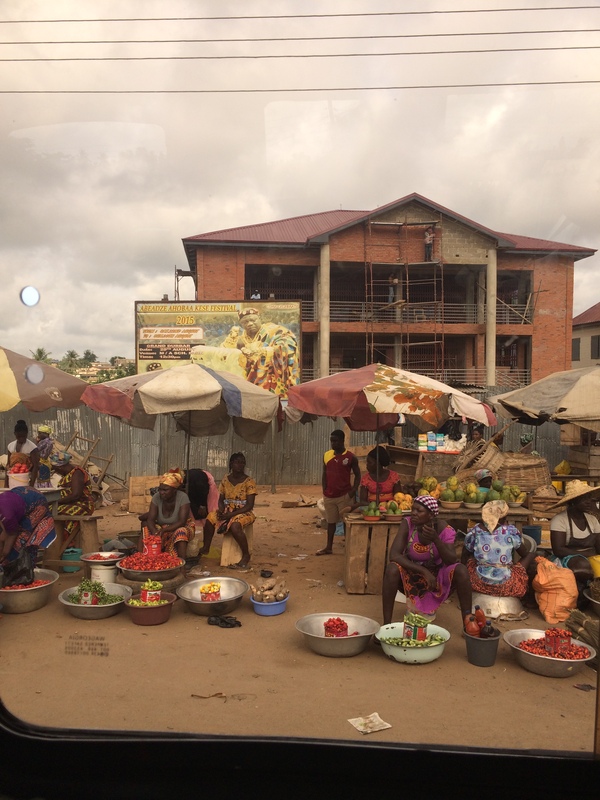 As we made the two-hour journey through the lush and beautiful countryside to our destination near the small village of Ajumako, I noticed perhaps hundreds of half-finished homes and buildings, some with lovely architecture, now abandoned. It’s as if there once had been great hope and expectation, then it evaporated. The money ran out. It was difficult to see these unfinished monuments to poverty and unrealized dreams. Yet among those abandoned buildings were those that housed small businesses, well-dressed women and men laughing and holding the tiny hands of their children on their way to church or to the market, and roadside stands selling food and sundry items. with a couple of bedrooms (where the cook and helpers sleep) and a kitchen area. In the front there a small store accessible from the inside and outside of the compound. We would patronize that tiny store daily, buying glass-bottled sodas and ice cream from a woman named Charity after our long, sweaty days. 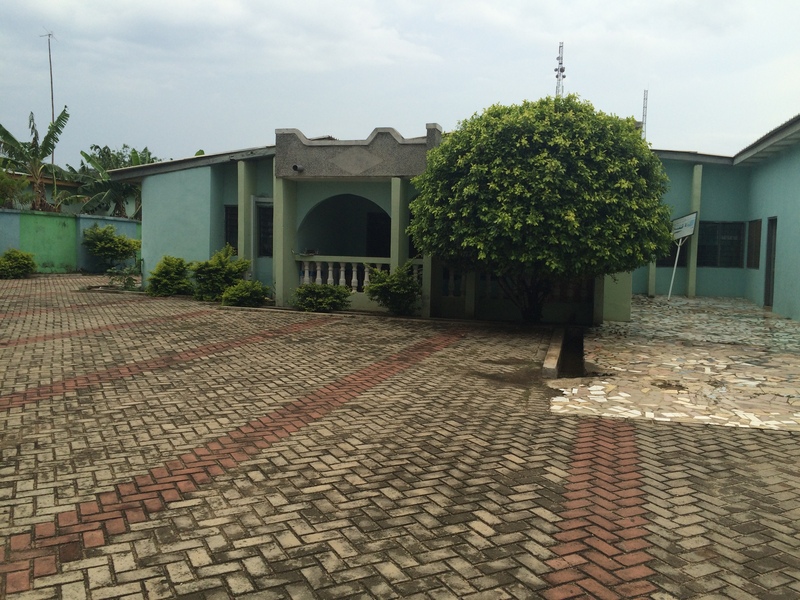 The guest house has about nine bedrooms (some with private bathrooms), a dining area, and a living room. The walls are porous so that when the rains come, the cockroaches (which are, I kid you not, almost the size of my hands) scamper about and the termites take to the air. Little lizards scurry across the floor. It is a simple structure with few decorations on the walls and tattered curtains on the windows. By American standards this is anything but a luxurious house. But that living room is a gathering space where we spent every evening talking, laughing, playing cards and Bananagrams, and on a couple of occasions watched movies projected onto the bare walls. Those bedrooms with peeling paint and squeaky old doors provided comfort and a place to rest after mentally and physically exhausting days. The bathrooms were equipped with showers that washed off the sweat and dirt. We didn’t care that they did not have hot water – who needs a hot water shower in Ghana? After witnessing the conditions of other homes, often tiny shacks with dirt floors and no plumbing nor electricity, it didn’t take long to appreciate the absolute luxury of our accommodations. We found ourselves constantly readjusting our ideas about what constitutes luxury. have donated hundreds upon hundreds of books for the library which was originally set up (beautifully) three years ago by Westtown’s librarian, Victoria, who was one of my co-chaperones. The shipments of books, while welcome, had been left in enormous piles where they collected dust, mold, spiders, and cockroaches. There were not enough shelves on which to place them, and no human power to sort, catalogue, and shelve them, anyway. We found our mission. Victoria and I worked all day in the library. 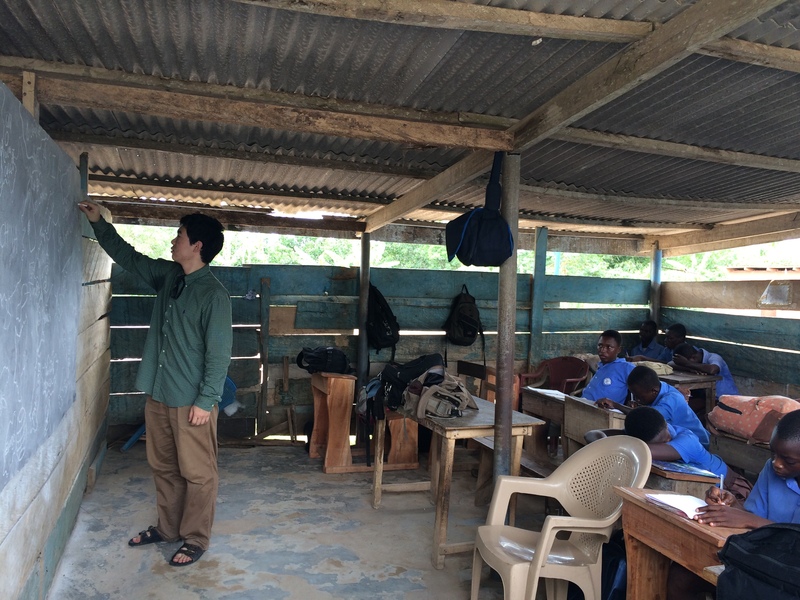 The other chaperone, Jon, scoured the villages of Essiam and Ajumako for wood and set about making bookcases with a few students. (It is worth noting that while I ran out of room for enough underwear in my luggage, Jon managed to cram about 80 pounds worth of hammers, drills, saws, and other tools into his.) The other students would teach until the end of the academic day, then join us in the library for two hours before dinner. This was our routine for two weeks: Sort. Stack. Saw. Hammer. Drill. Sneeze and cough from dust and mold (all of us). Label. Stack. Scream at spiders (just me). Repair a saw. Label. Sneeze. Hammer. Drill. Sort. Scream. Sort. Label. Stack. 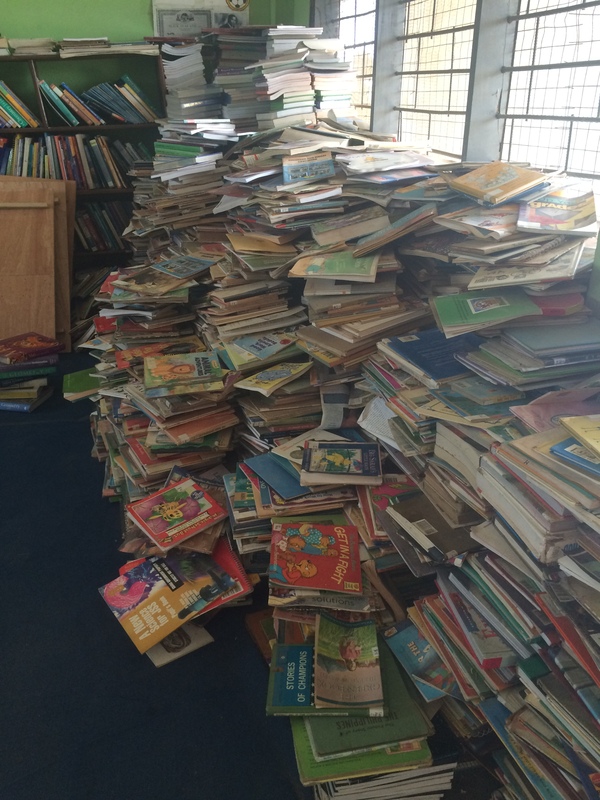 One day in the middle of sorting, I was standing near one of the many neatly sorted stack of books and heard the voices of the youngest students nearby. I turned to discover they’d come into the library, which they normally weren’t allowed to do at recess. 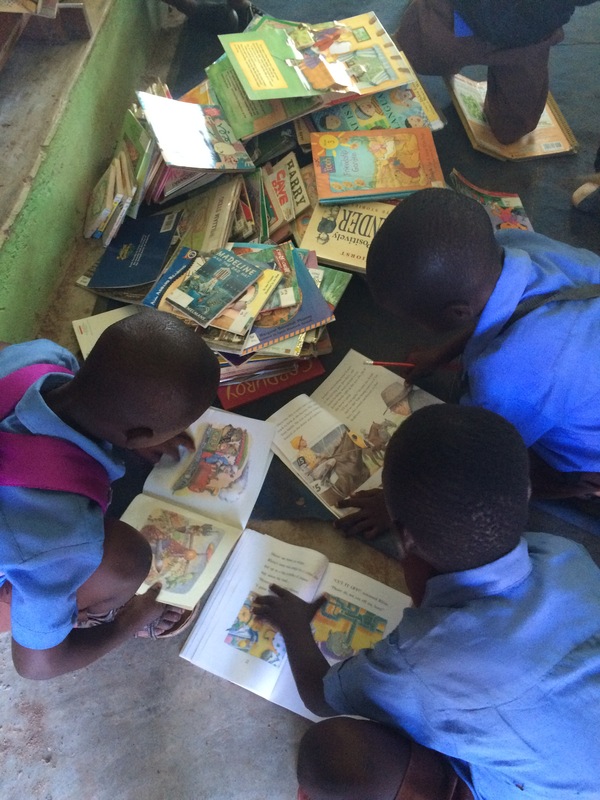 At first there were just a few kids grabbing books from stacks and plopping down to read them. I turned around again and suddenly there were about 30 kids all grabbing books from our sorted stacks. My heart sank. All that work so quickly undone made my eyes bulge. Victoria and I had begun to have doubts that we could get it all done in the time we had left and this felt like a major setback. Books were being strewn everywhere. The students and I tried to herd them out to no avail. I became panicky and frustrated. But I decided to stop trying to shoo them away and watched them instead. They were hungry for those words and pictures on the pages. The books were for them, after all. One by one they tugged at my shirt, “Madam, what does this word mean?” “What is a snowman?” (Which is really hard to explain to a child who’s never seen snow.) The ones who didn’t speak English well simply pointed with quizzical looks. One child pointed to the word butterfly, furrowed her brow, and held up her hand as if to say What is this? I linked my thumbs and made flapping motions with my fingers and said, “Butterfly.” She and her little friends collapsed in laughter and made butterfly hands too. And just like that my panic melted like a snowman in Ghana and my heart fluttered like, well, a butterfly. The rest of that week when I saw those kids around the campus they would make a butterfly with their hands to greet me. It was worth every moment of re-sorting. I would take breaks from sorting to check on classroom activity and survey the progress of the bookshelf makers. Jon and our students Hannah and Joseph were veritable machines, even though they were stuck with saws barely strong enough to cut the wood. They drew a small crowd of Heritage students daily who, at first, watched them work. Then they eagerly jumped in to help. They offered sawing relief and Jon taught them about the wood, how to measure it, and how to oil the saws to make them pass more easily through the wood. 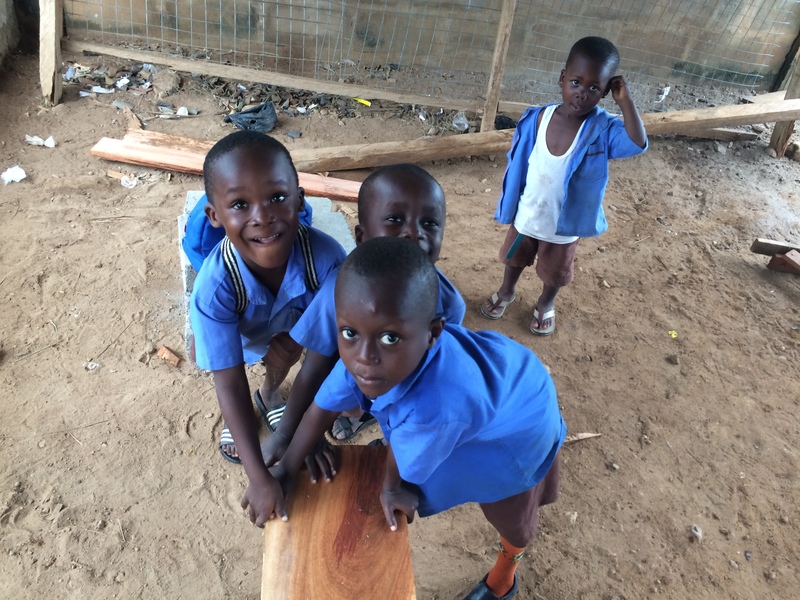 Even the smallest boys wanted to get in the action and they helped steady boards as they were being cut. I enjoyed watching the carpentry skills being passed from master to student, skills that are desperately needed in a developing country. What got to me more, though, was the joy and pride they felt in helping create something. Their smiles and high fives were priceless. moved the new bookcases into the library. There was heaving, grunting, and doubt that one big case would fit where it was supposed to. We erupted in applause when it did. In the last hours of our library time, we cranked the music and began shelving the books. We sang along to songs and danced the books onto the shelves. Some of the Heritage kids joined in the shelving and others looked on with giggles, unable to keep from moving to the music themselves. Those moments of team effort were beautiful and satisfying. 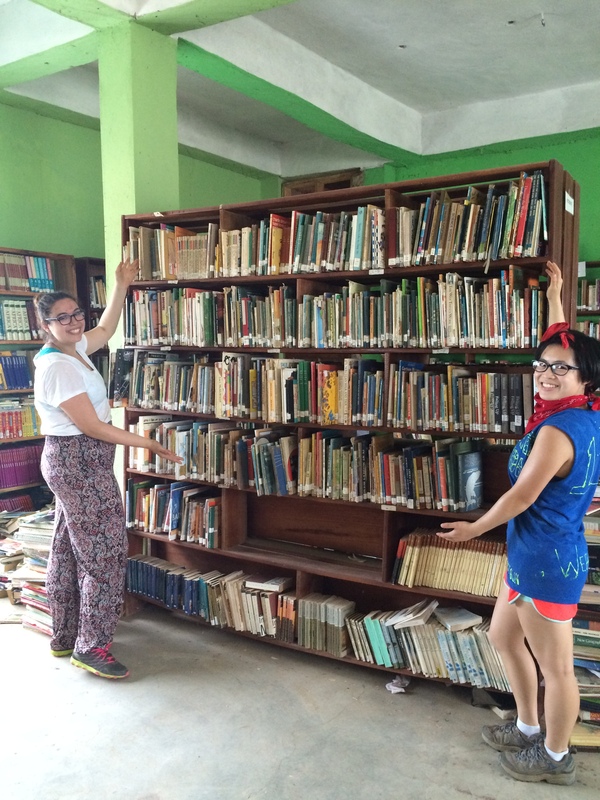 While we did not finish sorting all the books, we filled every inch of shelf space and Heritage Academy, once again, has a functional library. shack. And it’s LOUD. The children are boisterous, noisy, and their voices carry from room to room. The cacophony of children’s voices was unsettling at first for all of us, but our kids found their footing. The Heritage students were beguiled by them and us adults. 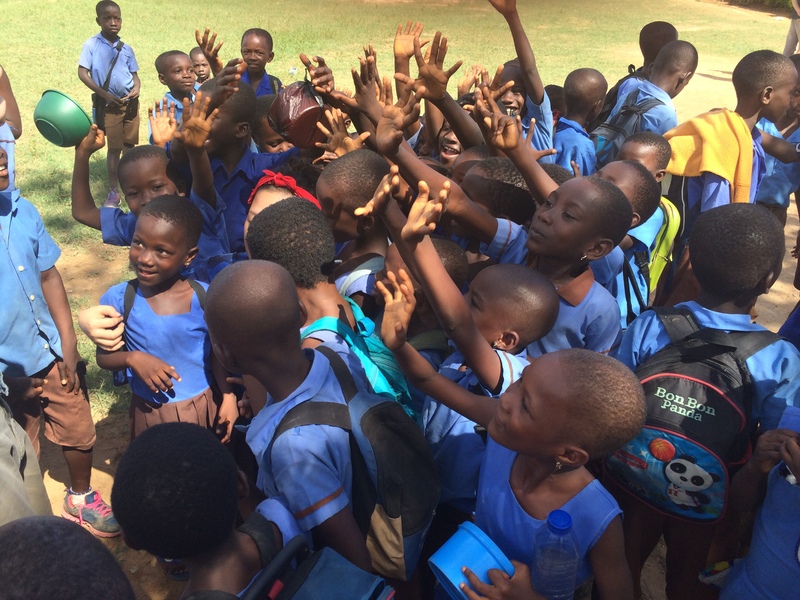 While the high school students have seen foreign volunteers come and go, some of the youngest students in the lower school have seen few white people (obroni) and even fewer Asians of which there were four in our group. They were fascinated by our skin, hair, and eyes. At recess, they would crowd around us, eager to touch and talk, even if English was difficult for them. They would run to us and ask, “What is your name?” instead of saying hello. Their next statement was, inevitably, “Will you take me as your friend?” And they meant it. They asked for addresses and phone numbers. 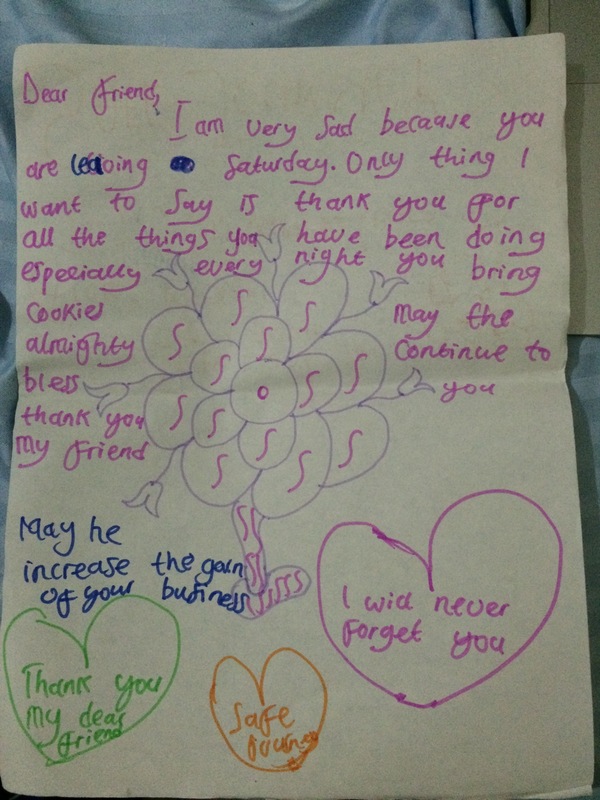 They wrote elaborate declarations of their friendship in letters to our students, and to us. It was beautifully quaint – who writes letters anymore? Children without computers. Will you take me as your friend?! We were objects of great fascination, scrutiny, and attention, which is to be expected of kids with limited exposure to the rest of the world. In one way, it was heartwarming and joyful – who can resist a child who wants to hold your hand, mug for your camera, and just be with you? In another way, it made me uncomfortable. I don’t think we deserved the pedestals we were hoisted upon, pedestals built only of the random fortunes of our birth. It is gratifying to be in a position of helper, but I continually struggled with the unwitting ego that develops doing service because it reinforces a tacit hierarchy. Our first world-ness was conspicuous. We were well fed, unlike most of these children. We came with suitcases full of clothing. We had plane tickets that would carry us back to homes with plumbing and electricity, to bright futures. Our students have colleges waiting for them. But we found them to be fascinating as well, these happy, energetic children whose lives warranted our absolute attention. We watched them closely. We listened to them, answered their curiosity. We discovered their fortitude and dedication to their education. We found what made them laugh. We learned that the recess antics of children are universal. They were teaching us as much about the world as we were teaching them. As the days passed, the swarms of children became individuals with names and stories, and the distance between us became slightly smaller. One of our students, a Korean boy named TK, was called “China” by Heritage students at the beginning. He became frustrated by this nickname and by the fact that they did not know the difference between Koreans and Chinese. He interpreted the nickname as an insult. We discussed this at one of our evening group meetings. Kwesi Koomson, the Ghanaian founder of Heritage Academy and our host, explained that the kids didn’t mean harm, they simply do not understand that Asia is made up of many countries, that China is the only Asian country they know. Calling him “China” was easy shorthand for them, just as obroni is shorthand for white person. Still, this explanation was unsatisfying to him (and for many of us; we didn’t necessarily like the term obroni either) and he became increasingly angry about it. One evening, Jon took him aside and said, “If they don’t understand the difference, then teach them.” It was brilliant, this suggestion to turn his frustration into an opportunity. TK scrapped his English lesson plans and did just that. The next day I went to observe his class to make sure things were going well. When I entered the room, Heritage kids were at the blackboard drawing a map of Asia and labeling countries, and TK had made a list of Korean products they would recognize. He smiled and gave me a thumbs up. The kids at Heritage no longer called him “China” after that day. On the last day of class a week later, I stopped in his classroom once again. 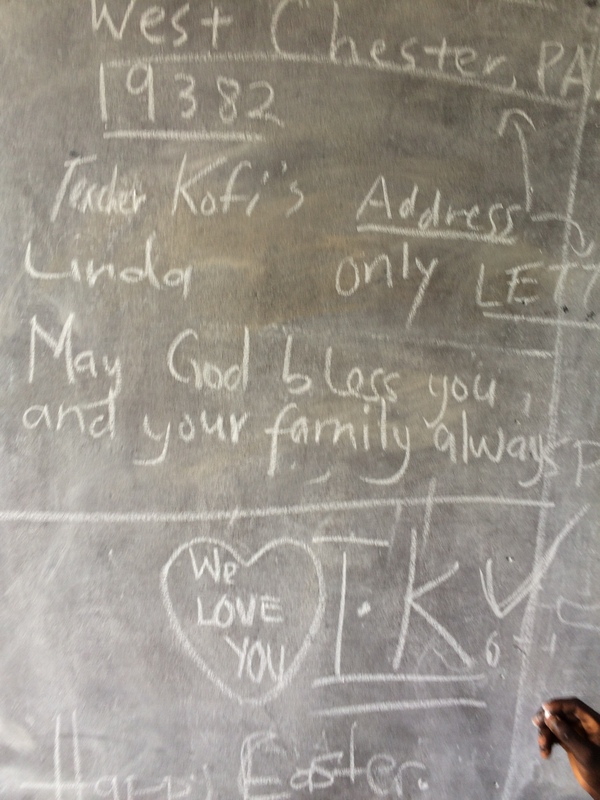 The kids had written on the blackboard, “We love you, TK. May God bless you and your family always,” among other scribbled well wishes. The students were clamoring for his attention, clinging to him, and giving him goodbye hugs. TK had written letters to each of them and returned their hugs, his smile lighting up the room. And there it was, the rubble of a barrier at their feet and a bridge built in its place. The relationships built in this kind of experience make the world smaller for those who travel, and make it larger for those who can’t. I was constantly reminded of this as we learned more about the people of Ghana and they learned about us. It wasn’t always comfortable and joyful, but it was powerful and transformative. A parting gift to me from a student who also stayed at the guest house. My favorite souvenir. I write. I connect. I travel. I make bad puns. This entry was posted in Uncategorized and tagged ajumako, ghana, heritage academy, service, travel. Bookmark the permalink.